The purpose of this article is to document the collective nature of gender performance and sexual pursuit, activities typically associated with individual rather than group behavior. 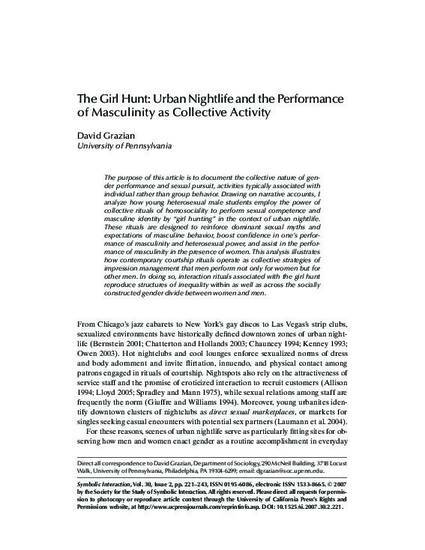 Drawing on narrative accounts, I analyze how young heterosexual male students employ the power of collective rituals of homosociality to perform sexual competence and masculine identity by “girl hunting” in the context of urban nightlife. These rituals are designed to reinforce dominant sexual myths and expectations of masculine behavior, boost confidence in one’s performance of masculinity and heterosexual power, and assist in the performance of masculinity in the presence of women. This analysis illustrates how contemporary courtship rituals operate as collective strategies of impression management that men perform not only for women but for other men. In doing so, interaction rituals associated with the girl hunt reproduce structures of inequality within as well as across the socially constructed gender divide between women and men.